During reading a article on GSR; I was stumbled when come to know that GSR can also work without SFC(Switch Fabric Card). Actually what happens when the SFC removed from the GSR Clock Schedular Card(CSC) comes into the picture. At that time all the line engines will stop work except line engine 0. So your CSC will work as SFC. what i think that at that time all line engines are stopped and there is no need for the clock thats why clock card(CSC) falls back to SFC card mode. It means GSR can be upgraded without shutting it down. How to secure lan so that any rougue laptop/pc donot get the ip address fom the dhcp, a big question mark, but possible in wireless media but what about wired media. Same question was asked to me few days back and my instant response was dhcp did not support authentication. But I replied we can use the dot 1x for the wired media. So i started out my testing lab with one of my colleague and installed domain controller with radius. We use the dot1x mechanism to authenticate the pc/laptops; After 2 days testing we got the positive results. 1. Get rid form the man in middle attack. 2. Dictionary attacks can be stopped with this. 3. Security of Lan; No one will get the ip address until and unless he/she is having domain username & password. I am writing document on this, If someone need on urgent basics kindly mail me. It is always recommended not to leak the information of network protocol which is running in ISP core. Why it is said, without leaking the information can someone gain the information of any ISP. So in the docment attached I have tested a scenario in which ISP is using OSPF and one of its esteemed client who is attached to any of PE be able to access the ISP network consequence major downtime. Thats why it is recommended not to use OSPF,EIGRP,IGRP,RIP with customer, If you are using then do it in a very secured manner. One mistake may lead kick you out from the organization. 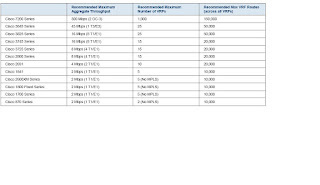 Prior fast ethernet interfaces does not supoprt MTU more than 1500 bytes. But now-a-days the barrior has been closed and cisco has opened the MTU barrior upto 1600 Bytes with the new release of 12.4(20)T. So no more problems in case of MPLS, you can access your applications without fragmentation. After waiting for long time, CISCO has added new data structuted named CSSR in CEF which is actually going to enhance the performance of CEF. It is available on 12.4(20)T platform. Secret Of CSSR: Actually CEF uses adjacency table for next-hop and mac-address resolution. If you are having n entries in the routing table with the same next-hop then for every entry it has to maintain the adjacency table which acquires more space. By adding new data structure into CEF, it will save only a single entry in the adjacency table for all the routes who are having same next-hop address. Few days back I faced problem related to the CEF. I tried to ping from one router to another but found packet drops. SO I initiated the first step with ping. By using extended ping I set the record option and find ping reply. So what is the difference when we use the ping with record option and without record option. Actually by setting record option ping packets uses the fast switching and without record option it uses the cef switching. So I conclude there might be problem with the CEF in the path. On 24th september, 2008 Cisco has official announced the l2tp vulnerability. A vulnerability exists in the Cisco IOS software implementation of Layer 2 Tunneling Protocol (L2TP), which affects limited Cisco IOS software releases. Several features enable the L2TP mgmt daemon process within Cisco IOS software, including but not limited to Layer 2 virtual private networks (L2VPN), Layer 2 Tunnel Protocol Version 3 (L2TPv3), Stack Group Bidding Protocol (SGBP) and Cisco Virtual Private Dial-Up Networks (VPDN). Once this process is enabled the device is vulnerable. This vulnerability will result in a reload of the device when processing a specially crafted L2TP packet. Note: L2TP implementations will need to allow UDP 1701, from trusted addresses to infrastructure addresses. This does not provide for a full mitigation as the source addresses may be spoofed. Note: L2TPv3 over IP only implementations need to deny all UDP 1701 from anywhere to the infrastructure addresses. mturoute is a small command line application that uses ICMP pings of various sizes in order to determine the MTU values on the path between itself and the target system. It also includes a "traceroute" like mode where it will attempt to determine the lowest MTU between the local host and each hop in the communication. The utility generates maybe 100 times as much traffic as a normal ping does, so you should exercise restraint when running it on networks you do not administer. During development and testing my ICMP capability was disabled completely several times, although a power cycle on the cable modem restored normal operation. You can use it for troubleshooting MTU problems. Devices running Cisco IOS versions 12.0S, 12.2, 12.3 or 12.4 and configured for Multiprotocol Label Switching (MPLS) Virtual Private Networks (VPNs) or VPN Routing and Forwarding Lite (VRF Lite) and using Border Gateway Protocol (BGP) between Customer Edge (CE) and Provider Edge (PE) devices may permit information to propagate between VPNs. Workarounds are available to help mitigate this vulnerability. This issue is triggered by a logic error when processing extended communities on the PE device. This issue cannot be deterministically exploited by an attacker. Cisco has released free software updates that address these vulnerabilities. Workarounds that mitigate these vulnerabilities are available. 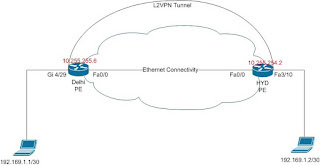 Customers running versions of Cisco IOS that support filtering of extended communities can prevent the corruption of the route target (RT) by applying a BGP route-map that removes RT entries on inbound BGP sessions. Note: The capability of filtering extended communities is only available in certain 12.0S and 12.2S based Cisco IOS releases. BGP session between the PE and the CE needs to cleared to make this configuration change effective. I have written a document on MP-eBGP(option B) which is widely used by many service provider for inter-as communication.